Welcome Blanket + MODA = Happening!!! MODA (Museum of Design Atlanta) is Welcome Blanket’s new project host! Welcome Blanket will be part of MODA’s “Making Change: The Art and Craft of Activism” exhibition, from June 3 to September 9, 2018. Betsy Greer is the curator. …send in a blanket/note package (or three or five) to the Smart Museum and want to do it again? …learn about the project but weren’t able to participate the first time? Welcome Blanket and MODA want you to get involved! 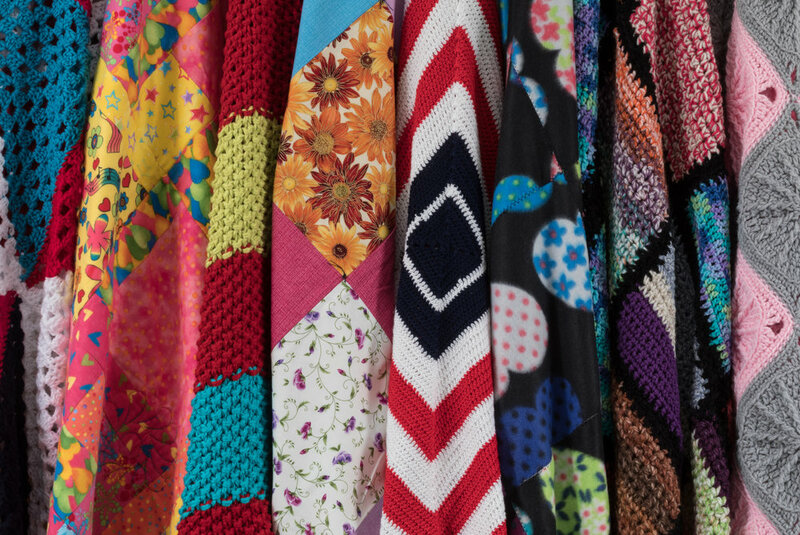 Sample Pattern, Note Template and Gallery of over 3200+ Welcome Blankets and notes that our incredible community has created so far is up on our website. The Smart Museum, our incredible inaugural host and partner, will be sending some of the Welcome Blankets and notes they received post-deadline to help kick-off the MODA show. The Smart also is assembling Welcome Blanket packages for distribution to our new neighbors. More news to come on that soon. Readers, if you are ever in Chicago, please stop by this amazing museum and thank its staff for all they have done to help launch Welcome Blanket. Follow us on social media (and please post using #welcomeblanket). Spread the word! Thank you to everyone who has been— and continues to be— a part of this project. We are making a powerful, personal gesture of inclusion. When cruelty, racism, and bigotry are eating away at our society, Welcome Blanket harnesses our creativity and community to stand up for those who are marginalized, those who are hurt, those who are often unseen. Together, we say: we are so glad you are here.